This time around we were flying one of our new DJI Inspire 2s with the all new X7 camera system capable of 6K RAW video capture and 24MP still images. The main purpose of the mission was to capture spectacular video of a gigantic US flag raised by a group called WORLD MEMORIAL on the US side of the Falls. World Memorial’s gig is to travel all over the USA raising awareness for Veterans and 9/11 by raising HUGE flags which is a pretty interesting cause and something we were happy to assist with. The flag raising was on the US side of the border but the best vantage point from above was to shoot the event from Canadian airspace. Of course, we just had to capitalize on every aerial cinematographer’s dream by capturing loads of Niagara Falls footage in every format possible while we were up there. As you can see on our short video, we got some great angles and footage you could only shoot with a drone. As I have said many times before, drones fill that aerial cinematographer’s sweet spot between 200 and 400’ AGL. This is one of the reason’s we are such a hot commodity right now. I have blogged before about the challenges in obtaining all the permits, clearances and approvals that are required to fly a drone legally in the restricted airspace above Niagara Falls. 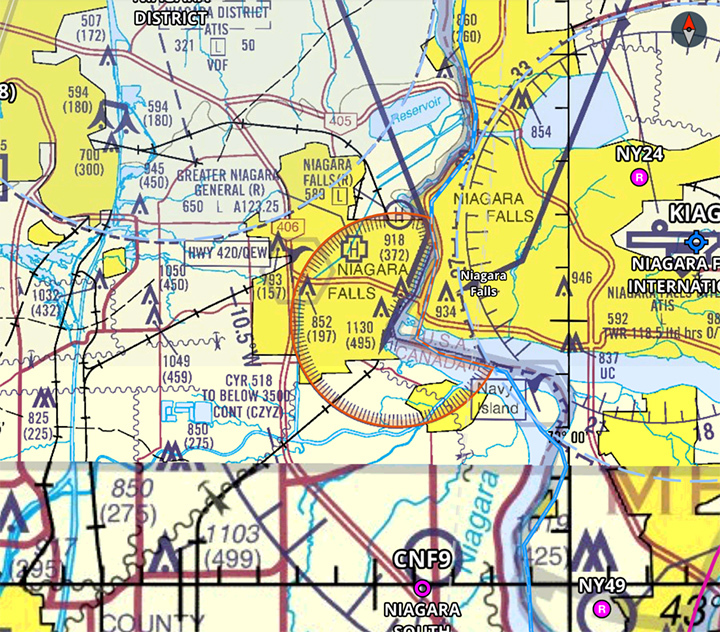 This airspace is officially known as CYR-518 and it is important to point out that it is completely off limits to drones and all drone operators who do not have extensive experience and, of course, all their permits, permissions and clearances in place (and a lot of patience). CYR-518 is very busy airspace shared by multiple helicopter tour operators, airplanes, a zip line and millions of people annually. Niagara Falls is NOT a place to attempt to fly drones illegally! Seriously, don’t do it!!! 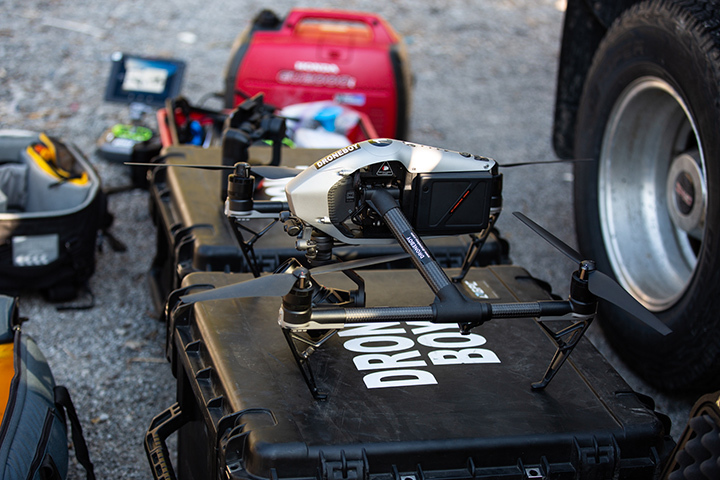 The permit process recently got a lot easier for us at DroneBoy for a number of reasons. We now have our National Special Flight Operations Certificate (S.F.O.C.) in place. 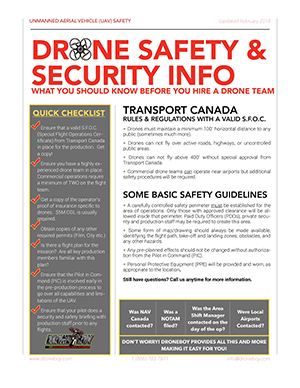 This is our Canada wide UAV flight permit and ours covers all our 15 working drones and our 5 main pilots. As long as we remain compliant with the 75 individual clauses listed in our flight permit, we can fly our drones anywhere in Canada anytime for commercial purposes. Hooray! The next piece of the puzzle that helps us respond very quickly when we are asked to fly drones over Niagara Falls is that we have a Restricted Airspace Endorsement on our National S.F.O.C. This means that we do not need to apply to Transport Canada (TC)for a new S.F.O.C. to fly each Niagara Falls drone job that comes up. This is very good news as a new or revised Restricted S.F.O.C. can easily take over 30 days to obtain. However, all we need to do is get approval from “the user agency” who control the CYR-518 restricted airspace. In this case that User Agency isTransport Canada but we work through the local office who we have a great relationship with and can usually get our approvals in place in as little as one week. 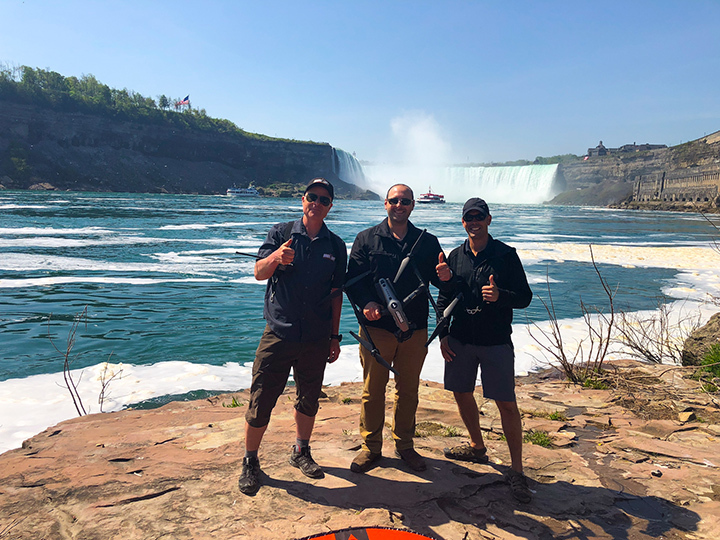 Also, over our four years flying drones at Niagara Falls we have developed an amazing working relationship with the Niagara Parks Commission, the Niagara Police and all the other partners and stakeholders who we need to work with to make this kind of an epic mission possible. Last but certainly not least, I am proud of my very dedicated team who assisted me during this epic mission. These include the following awesome groups and individuals. Thank you all! Thanks everyone – Fly safe! 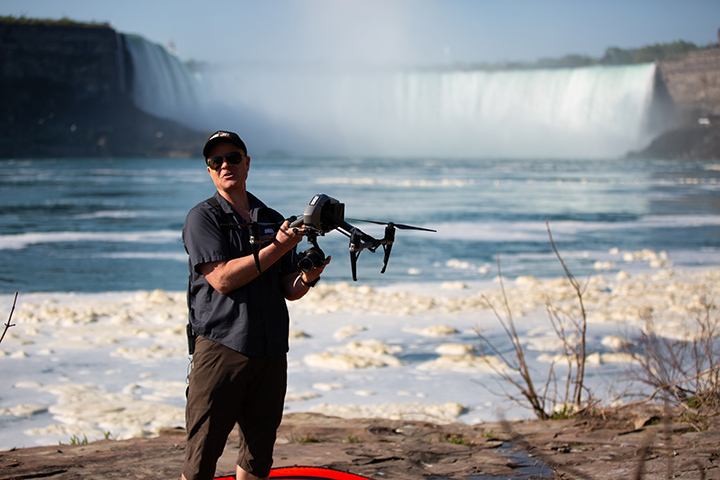 If you want to know more about flying and filming with drones over Niagara Falls contact us at DroneBoy today.